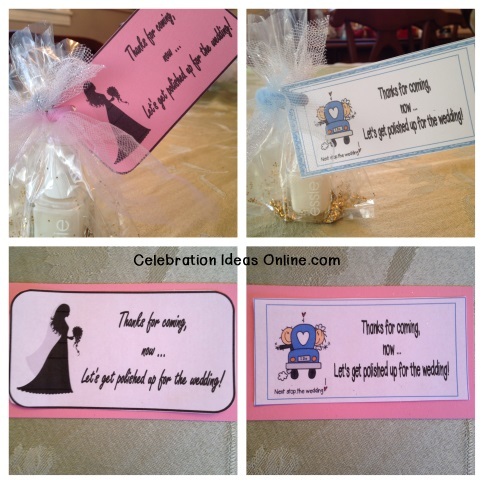 Fun and easy Bridal shower favor idea with printable tags for the favor. Bridal Shower Favor Tags Creative bridal shower favor idea. Gift a bottle of nail polish (not included) to thank them for coming to celebrate with the bride to be and attach this ever so clever gift tag that says "Thanks for coming, now.. Let's get polished up for the wedding". There are two versions of the tag included in the file, along with a sign to let guests know they should pick their favorite color! All you have to do is choose the version of the tag from the download file, print on cardstock, trim and tie to the nailpolish gift! It couldn't be any easier!